In 1765, James Chesnut and Joesph Kershaw established a trading post in Granby Village in an area known as ‘the Congarees’ along the Congaree River in South Carolina. 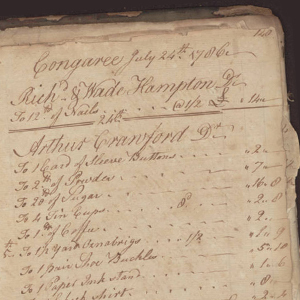 The partial ledger digitized here, containing entries on customers and their purchases, tracks the post’s activity from June 1784 to September 1786. The names of notable South Carolinians of the day (such as Wade Hampton) appear throughout the book. The ledger itself resides at the Cayce Historical Museum in Cayce, South Carolina.